‘Fruit medium sized, turbinate. Skin of a rich lemon-yellow colour, thickly covered all over with russety specks and dots, but round the stalk and over the crown it is completely covered with a coat of cinnamon-coloured russet. Eye open, set in a round furrowed basin. Stalk an inch long, inserted without depression. Flesh white, tender, fine-grained, juicy, sugary, and richly flavoured. A handsome and very excellent pear, ripe in November and December. The tree makes a handsome pyramid, and is a good bearer.’ [Hogg – Fruit Manual p.160/1860]. ‘Gained by Alexandre Bivort, Louvain, Bel.’ [Pears of New York p.287]. It appears to have been bred by Bivort and first fruited by him in 1847. I have no other information on the history of this pear. It was figured in Album de Pomologie [ADP vol.2, pl.125/1849], the illustration used here. Listed only in the 1857 catalogue in an Addendum as ‘Beurré Berkman’s’ [Pear no.41/1857]. In a copy of the 1857 catalogue the number ‘41’ is changed to ‘44’ and this aligns with the diary numbering. ‘44. Sugary, perfumed of highest excellence.’ [Diary B, MP A2951/1862]. Obtained from Veitch’s Nursery, probably the original Exeter premises. 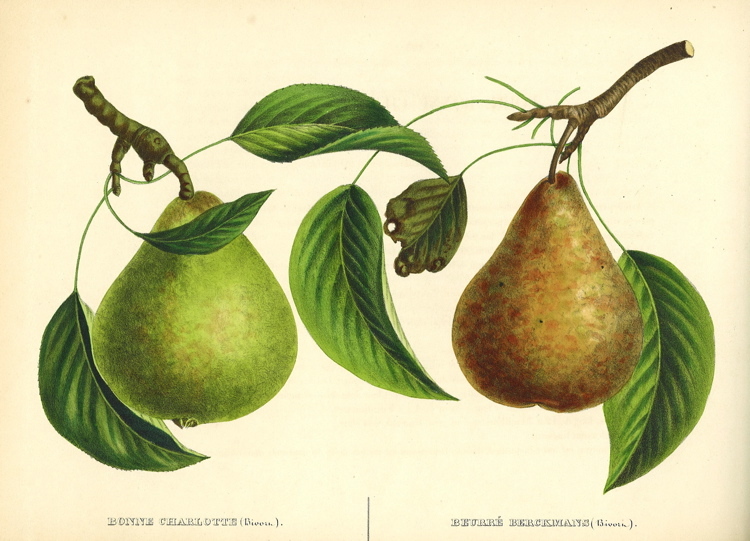 Pear ‘Beurré Berkmans’ | ADP vol.2, pl.125/1849 | Pomologische Bibliothek. Beurré Berkmans is the pear on the right.